This was Marvel’s first real test after Spider-Man #700 (if, by some black magic or voodoo, anyone is unaware of the events that ended The Amazing Spider-Man and began The Superior Spider-Man, but still cares about it being spoiled for them, stop reading here). Writing a relatively self-contained issue where Peter Parker isn’t Peter Parker but is actually Otto Octavius but he’s kind of Peter Parker is tough, but it’s not as tough as forcing him to interact with the most perceptive and most familiar hero with whom he interacts regularly, Daredevil. And though it’s ironic that the first tough task was taken on by someone not in charge or related to the earth-shattering, death threat inducing events, it’s also refreshing, as Mark Waid handles the task with nothing but expertise and intelligence. Waid smartly leads off the issue with a bit of quick catch-up session for readers who are only picking it up because of Spider-Man, and from that point forward, I was pretty convinced that it was all going to be handled perfectly, because even though much of the interest in Daredevil #22 has nothing to do with the title character, it’s still a Daredevil comic, and Waid has a once-in-a-run chance to pick up hordes of new readers. And, honestly, he earns them. The book marvelously weaves a quick rundown of all Daredevil can do with an examination of Spider-Man, the way he acts and what he says. I’m a particularly big fan of when Daredevil listens to Spidey’s heartbeat to determine that it is, in fact, Parker. It’s a direct situation that gets off how intelligent Murdock is and how highly-tuned all of his senses are. What Waid is doing in this book is almost magical. The juggling act that goes on within the pages of this book is deceptively complicated, and to effectively convey all of the things that are necessary for this book to work is a task that would leave most writers shaking in their underwear. He has enough Spider-Man for Spider-Man fans, enough Daredevil to make it worthy of his title book, a villain that moves the plot along as well as exposing problems within Spider-Man, and a really wonderful display of just how skillful Matt Murdock really is. And on top of that, there are very weighty and important dealings in the day-to-day life of Murdock that are handled cleanly and correctly. 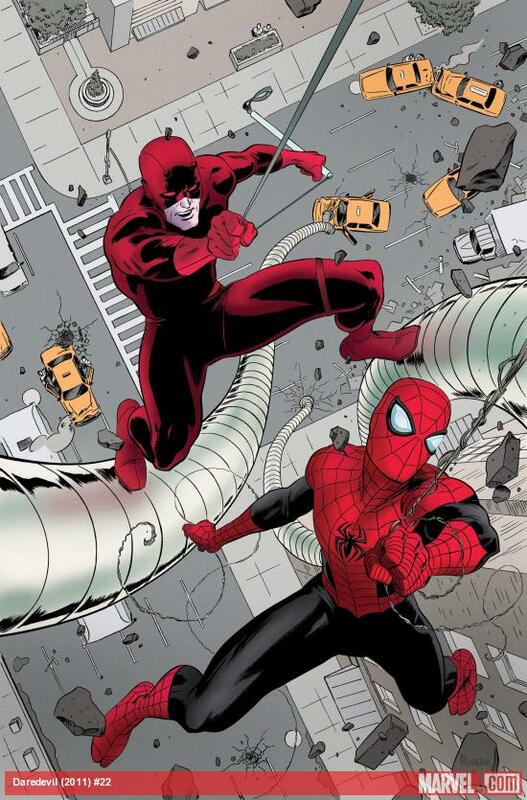 As with the entirety of this creative teams run together, the art is a wondrous, colorful adventure that uniquely displays each of Daredevil’s powers in an interesting and clear fashion. It never takes itself too seriously, while always taking itself seriously enough, and much like the art in the Hawkeye book, it’s a lot of goddamn fun. It’s also nice to see Daredevil getting involved in all of the Marvel NOW! fun, as I was personally worried that books like this, Hawkeye and others were going to be hung out to dry with the flurry of new (and often high-quality) work the company has been putting out. The book isn’t perfect, it can get a bit to expository at points (some subtext would have been nice), but other than that, it’s fantastic, and most important, it accomplishes everything it needed to: handled Spidey with grace, was a soft opening for new Daredevil readers, and swiftly moved the plot along in spite of it all. If nothing else, Waid should have earned the readership of a hefty portion of web-slinger fans. This title got rebooted around the same time as the New 52 and I have to say out of all the New 52 and Marvel Now titles this has been my absolute favorite relaunch. Each month it is consistently my favorite superhero comic. This issue was no different, another great read. Great review Brad.